Before I knew about all the benefits of using a ceramic griddle, I use to just use any surface to cook my food. Now, with all the great information on the internet, you can learn about anything in a few minutes. Most people simply don’t know how bad some of the nonstick cooking surface are. 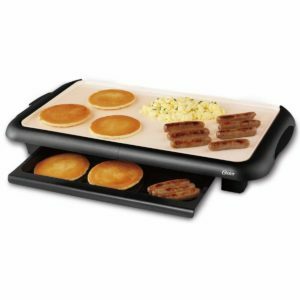 What is a Ceramic Griddle? Ceramic is a type of clay that has been hardened in a process known as tempering. A ceramic griddle is not made of clay but usually some other type of cheaper metal, such as aluminum and then coated in ceramic. Ceramic coating is ideal because its organic and not synthetic. It’s much better for your health than other chemical nonstick materials that they put on cookware. Ceramic coatings are become more popular now that they are realizing how dangerous Teflon based coatings can be for your health. Ceramic is also easier to apply to cookware because it usually only require one coat application, whereas other nonstick coatings require several. Once the ceramic coating is applied it’s set to cure in kiln. This process makes it emit less carbon dioxide than other aluminum and teflon based products. Ceramic has been proven to be MUCH safer than the alternative because you can heat it up to an extremely high temperature (842°F) without having to worry about it melting. Ceramic is an organic clay and sand based material that’s much better for your health than chemical formulas created in a laboratory and sprayed on aluminum. With a ceramic griddle, you won’t get any toxic fumes or chemicals that will break down into your food. Now that the benefits of ceramic is becoming more well-known, more and more products are coming out. A couple of years ago you couldn’t even find a ceramic griddle. Now, there are many out there with ceramic coating and let’s take a look at the best that I could find. A good friend of mine bought this ceramic griddle back in 2016 and I have used it several times. For this review I asked her what she thought and she had nothing but good things to say about the Zojirushi ceramic griddle. I’ve had electric griddles that have had teflon coating surfaces and those tend to get scraped off once you try to wash them. One time I accidentally thought that it was cast iron and used a metal brush and the entire surface came off… With ceramic the surface doesn’t flake off she has had hers for over 2 years and it looks brand new. The ceramic surface is healthier than teflon and it’s a great nonstick material. She doesn’t even clean it very often because nothing sticks to it. After I used it, I was shocked how nothing sticks compared to cast iron, where it’s like velcro. The Zojirushi ceramic griddle also gets surprisingly hot in a very short time, making it perfect for meats and vegetables. 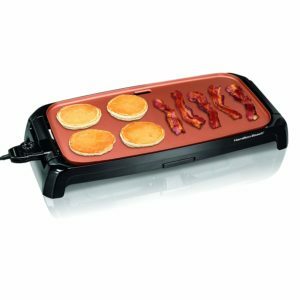 With most electric griddles I find that they don’t get as hot as I would like but this one certainly seems to be different. Perhaps it might have something to do with the ceramic? Here’s one of the first ceramic griddle pans I purchased and GreenPan is definitely one of the best out there when it comes to ceramic cookware. All of their products use a healthy nonstick ceramic coating and I have bought a couple of these as gifts for friends and family and the LOVE it! If you have a teflon coated pan then toss it in the trash and get a ceramic griddle as soon as you can. You also won’t ever have to use cooking spray every again if you use a griddle with ceramic coating like this one. The ability for food to slide right off when your done cooking is amazing and knowing that you’re cooking on a surface that’s healthy makes your food taste better. 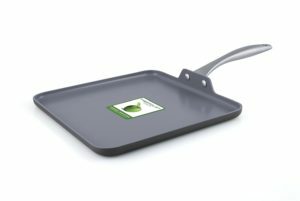 I’ve had friends that have replaced all of their cookware with GreenPan products because they love this ceramic griddle so much. I have to say that I’m not a big fan of Oster products. I purchased an espresso machine-made by them and it broke in the first day. 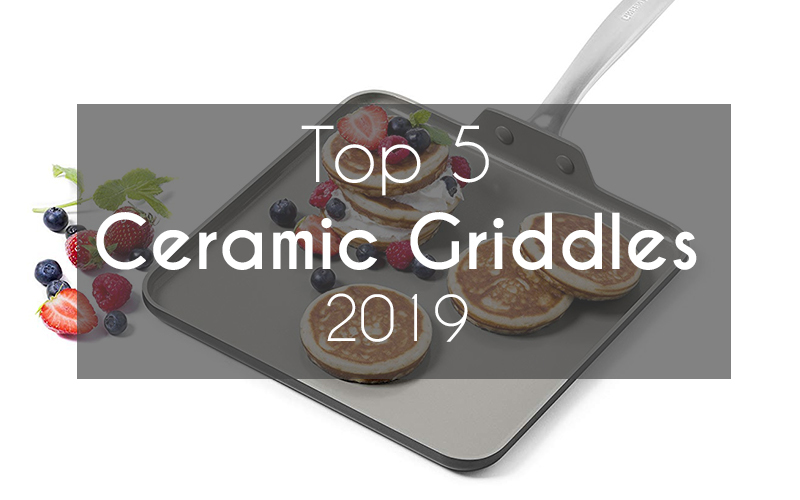 I did want to include their electric ceramic griddle on the list because if you’re on a budget it seems like a good option for around $30. This product does have over 1,000 reviews on Amazon, so I decided to see what people are saying. From what I can see, it tends to get very hot and often times will burn your food if you’re not careful. This can be a good thing if you don’t want to wait too long for your ceramic griddle to heat up. There seems to be a couple of issues with the grease try contraption on the bottom and the sides don’t have a little lip to stop grease from falling off. 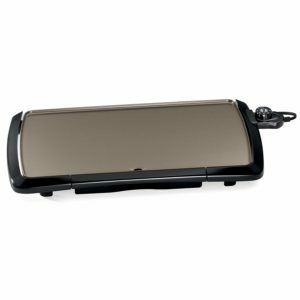 Nothing bad to say about cleaning and if you’re looking for a budget ceramic griddle then this looks like the best option. Not the biggest fan of Hamilton Beach products as well but since this is Amazon’s choice I thought I would have to take a closer look. The first thing I like about it is that it has a reversible ceramic plate that you can throw in the dishwasher. I can assure you that you will probably never have to do that anyways because nothing sticks to ceramic. Most of the products by this brand can be a bit expensive and the quality is not always the best. Many of the complaints here are about the drip tray and the plastic frame not being the best quality. 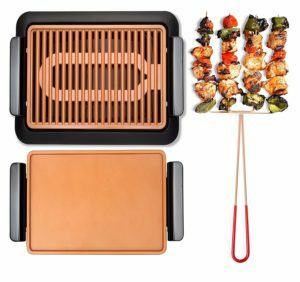 The ceramic griddle is not a problem and the copper color looks pretty stylish. Doesn’t seem to be many complaints about heating but there are problems with sound. Sound? Yes, with cheaper electric griddles you can hear a buzzing sound which can be quite annoying. Overall, I would wait for Hamilton Beach to improve the design and come out with an updated ceramic griddle. I have been wanting to try this one out for a while after seeing it on tv. I have yet to purchase one because it seems a bit overpriced, just as most of the as seen on tv products are. They always get the paid actors to talk about everything that’s good about the product and then usually when you get it, it’s junk. While this ceramic griddle doesn’t seem to be junk, there have been quite a few complaints. They don’t really talk much about the ceramic coating, leading me to believe it might not be the best quality coating. Persoanlly, I would stick with a more reputable brand, such as GreenPan, that has a nice track record of making high quality ceramic products. Hopefully I will be able to give this one a try soon, maybe from a friend but for the moment I will stick with the tried and tested ceramic griddles that have been around for years. Here are a few final notes that you can consider before purchasing your new ceramic griddle. Before you purchase the product, you need to make sure that it is manufactured by a reputable brand and surely is the kind of product that you wanted. A reputable brand will only launch the product that is able to offer the high-quality of services as they have their reputation at stake if anything goes wrong unlike any of the other company that is offering you the similar kind of products. Out of all the available choices you need only to select the one that is worth it and will surely provide you high quality of services. Before you make the final purchase, properly check that the materials that are used to make the product are pure and are not mixed with any kind of harmful element for sure. The ceramic coating alone is able to offer you the benefits but might cause some kind of harm to your well being if you happen to consume the food that is cooked in those utensils. All of the points mentioned in this article were meant to help you understand various benefits that are offered by the ceramically coated cookware. You can easily buy these utensils from any of the offline or online methods that you prefer. That just about covers the best ceramic griddles out there for right now. Every year they seem to be improving designs and coming out with new ceramic griddles, which is great. I hope that all the chemical teflon cookware is soon replaced with ceramic, since it’s much healthier for people. personally, I own several ceramic cooking products and I’m a huge fan of ceramic, stainless steel and cast iron. Each of them has their own unique qualities and each of them are great to cook and great for your health.